The continuing look at musicians seen wearing hockey jerseys shall continue this fine Sunday as I've discovered a pile more. I find this to be a fascinating topic since musicians rarely show their favoritism towards sports teams being that they have fans across the world, but it's a glimpse at them showing a small iota of appreciation towards a fanbase that is loyal to its hockey team. Could it be considered a cheap way to garner fan support? Sure. But I think it's way more interesting that they don the colors and try to grab the fans' attention through their hockey support. He's shown his support for the Phoenix Coyotes before, but I'm starting to be convinced that Alice Cooper is a hockey fan. "The Godfather of Shock Rock" normally dresses in his black attire to take the stage, but he breaks out in a hockey jersey occasionally when the time calls for it. Case in point? Here's Alice Cooper in a Team Finland jersey! How cool is that? 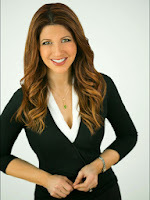 You may recognize Christi Paul's name from her normal job as weekday news anchor for HLN and weekend anchor for CNN's New Day. Christi is a pretty accomplished woman as she's also a musician when she's not reporting the news from Atlanta. You might be saying, "Teebz, she's not a musician", but I assure you that she is. Here she is singing the anthem at an Atlanta Thrashers game, and here's her video for her song called "Wake Up In It"! I hadn't heard of Annakin Slayd before writing this article, but he's actually a musician that has a love for Montreal sports. He wrote a tribute to the Montreal Expos' lost season called "'94 Fall" after the baseball strike canceled their shot at the World Series, and he's written a great song about the Montreal Canadiens called "Rock the Sweater" seen in the video below. He even makes mention of former Canadiens such as Mike Keane, Patrick Roy, Guy Carbonneau, and Ken Dryden in the song! So you'd expect him to be wearing a Canadiens sweater, right? Here's Annakin Slayd wearing a Team Canada jersey instead! He does wear the Habs uniform in his video, though. Take a look. I was previously unaware of who Ginette Reno is, but she's actually a big deal. She is a gold and platinum selling Canadian musician in English and French, and has recorded somewhere around 60 albums. She's very well-known in her hometown of Montreal where she was invited to sing the national anthem at the Bell Centre. And of course, she supported les Habitants! REO Speedwagon has carved out a very successful music career over the years. They've had big hits, they've enjoyed a pile of album sales, and they routinely have excellent concerts. Kevin Cronin was with the band for their 1972 album R.E.O./T.W.O., replacing original vocalist Terry Luttrell. However, Cronin left the band in 1973 due to internal conflict before returning in 1976. Cronin penned the #1 hit "Keep On Loving You" in 1980, and has been a part of the band since. Cronin, who is from Chicago, recently took the stage in support of his Blackhawks! You may recognize Melora Hardin's name from her work on NBC's The Office where she played Jan Levinson, but Melora Hardin has also been a singer in TV and movies. She played a nightclub singer in Disney's The Rocketeer where she sang "Begin the Beguine", and starred in the TV movie Tower of Terror where she sang "Boy of My Dreams." She sang the anthem for the Anaheim Ducks on October 13, 2010 and then performed the anthem for the Phoenix Coyotes three days later! Unfortunately, I can't find an image of her singing in Anaheim. Little help on this one? Rutgers opera voice student Stephen Saharic has done something not many opera singers can claim: he's sung the national anthem at a New Jersey Devils. Twice. That's pretty awesome. The first time he sang the anthem, the New Jersey Devils hammered the St. Louis Blues 7-1, and his second performance came this past Friday as the Devils fell to the Red Wins by a 5-4 score in the shootout. Saharic's baritone voice has yet to record a loss in regulation for the Devils, so maybe they keep bringing him back? The best part? Saharic wore a jersey with Adam Henrique's name and number! Vanessa Morgan is a Canadian actress who is known for her work as Bird in the MTV teen drama Finding Carter, Amanda Pierce in the Family Channel series The Latest Buzz, and Sarah in the television film and series My Babysitter's a Vampire. She also appeared on the Canadian version of The Amazing Race with her sister, and she's currently working on an emerging music career. The Ottawa-born Morgan was recently invited to sing the national anthem at a Senators game! So there is another pile of musicians who are wearing hockey jerseys. If you want to see the full list, you can find all of the musicians in jerseys here. If you have any photos you want to submit, fire me an email with the link, and I'll credit you! This is the uniform that the Charlotte Checkers will wear tonight when they face the Milwaukee Admirals. Yes, I realize that the uniform isn't normally what the Checkers wear, and that's why I'm writing this. You see, the Checkers will promote the NBA's Charlotte Hornets in a cross-sport promotion tonight as they host the Admirals on Hornets Night presented by Husqvarna - yes, they have a game-night sponsor for this. If you know anything about me, you probably sense the disappointment I have for the Checkers franchise on this one. I understand that the Checkers are the lesser of two professional sports franchises in Charlotte, but this is one of the dumbest things I have seen. In no way, shape, or form do the Hornets need the Checkers to help promote their brand, especially when it comes to an AHL hockey team helping them. Unless the Hornets have some sort of clause written into the lease for the arena by the Checkers that says they have to hold a Hornets night, hockey teams should not be promoting the highest level of basketball team in the state simply because they can. According to the Checkers' release, "The jerseys, which feature Charlotte Hornets colors and primary logo on the crest along with a modified Checkers logo on the shoulders, will be available for auction immediately following the game to benefit the Checkers Charitable Foundation and the Charlotte Hornets Foundation." 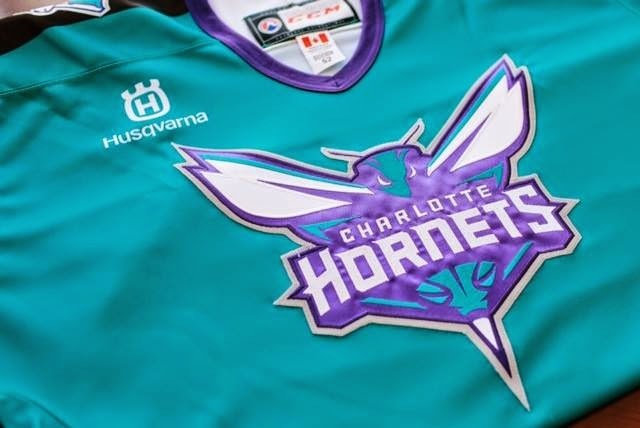 So not only are the Checkers helping the Hornets promote the Hornets' brand over their own, they're also raising money for the Hornets' charity. Something doesn't seem right about this. How about some more salt to the wound, you say? Sure, we can do that. "Other Hornets Night merchandise, including hats, t-shirts, pucks and more, will be available for sale beginning with the Checkers’ Black Friday sale at their EpiCentre office and continuing throughout the game." Oh, and don't forget that "Hugo, the Hornets’ mascot, and the Honey Bees dance team" will also be at the game as well. Is this a hockey game or a basketball game? Everything points to a basketball game right now. The game saw the Checkers get out to a 3-0 lead early in the second period before the Admirals roared back to tie the game at 3-3 at the end of 40 minutes. The third period was nothing but old-time hockey as a line brawl broke out that included a good, old-fashioned goalie fight! 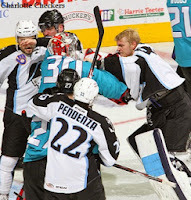 Charlotte's John Muse and Milwaukee's Magnus Hellberg tangled in their pads and each earned game misconducts, forcing Drew MacIntyre for Charlotte and Marek Mazanec for Milwaukee to finish the game! One things settled, the teams traded goals to make it 4-4 and appeared headed for overtime, but it was Charlotte's Phil Di Giuseppe who potted the game-winning goal with 1:30 remaining to give the CheckerHornets the win! At the end of the day, no one will remember the jerseys in the annals of history, but the win may help the Checkers make the playoffs this season. However, whenever someone wears the CheckerHornets jersey, it may cause a double-take to figure which team that jersey is supporting. Again, the NBA needs no help promoting itself and the Checkers needn't volunteer to do so on their own accord. The Checkers shouldn't be giving up their identity for an NBA team when they could use the marketing more than the Hornets can. But if they do, the least they could do is provide a themed jersey to the anthem singer on a theme night. She is part of the team on game night. You're better than this charade, Checkers. There is no one that will deny that the Buffalo Sabres have struggled this year with their patchwork lineup. They have some bright spots and they play hard, but they simply don't have the talent on paper to match up with the NHL's best most nights. On those few select nights where the star align, the Buffalo Sabres do the unthinkable and play extremely disciplined hockey in following their systems and making good on their chances. And there are nights where all it takes is a little dumb luck to earn the win. Tyler Ennis showed that a little magic comes in handy sometimes as well. I'm not sure the Montreal Canadiens appreciated Ennis' magic act tonight, but Ennis helped the Sabres down the Canadiens by a 2-1 score on this incredible goal. That is some amazing stick work and concentration from the shifty centerman. It looks like he runs out of real estate as he cuts in on Price, manages to kick the puck through what little opening there was, and then recovers just long enough to be able to get his stick on the puck for a backhander. 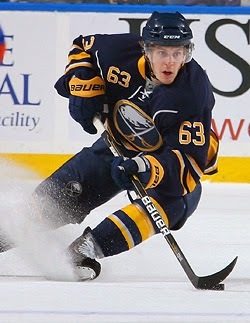 Ennis showed no give-up on that play, and he helped the Sabres to the victory tonight. The Sabres need more guys playing over their heads this season if they want to make a run at the playoffs. For a team that everyone assumed might just tank this season, it looks like the Sabres have some fight in them over the last few weeks, and Tyler Ennis embodied that fight tonight. The Hockey Show, Canada's only campus-produced hockey radio show, is beyond excited for tonight's show. We're had some pretty big guests on the show in the past as we're featured current and former players from all different leagues. Recently, we welcomed Brad Lukowich as the first Stanley Cup winner to our show, and he gave an incredible interview. Tonight, we are humbled, honoured, and privileged to welcome our second Stanley Cup winner as we take some time to speak with former NHL great Theoren Fleury! It will be a short interview with Mr. Fleury, unfortunately, as he's in Moose Jaw for a book signing as he's currently doing a book tour for his new book, Conversations With a Rattlesnake. He scheduled to be at the signing at 5pm, so we'll be pre-recording the interview with Mr. Fleury before he gets into the signing event. In saying that, we'll open up the phone lines after the interview for your comments as we talk about Mr. Fleury, his books, his experiences both good and bad, and how we viewed him as a player. I also want to point out that he'll be in Winnipeg this Sunday, November 30 for a book signing at the Grant Park McNally Robinson location at 3pm, so get out to see Mr. Fleury when he comes to town! I'm going to be down there to speak with Mr. Fleury and get a scribble on a book or two as well! We'll also talk about the losses this week of Pat Quinn and Viktor Tikhonov and the impacts they had on the game of hockey, Martin Brodeur getting a shot with the St. Louis Blues, the Winnipeg Jets dropping two and then winning two, the Bisons and their recent games against the UBC Thunderbirds and the upcoming games against the University of Alberta, and, if time allows, even more hockey stories! 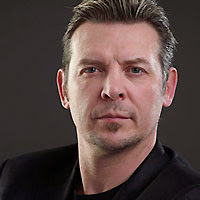 We'll be live on the air at 5:30pm and the phones will be open after the interview with Theoren Fleury! Hit us up on 101.5 UMFM on your radio dial in the Winnipeg region or you can listen live between 5:30pm and 6:30pm CT on your web-enabled device at the UMFM webpage! Give us a call at 204-269-8636 (269-UMFM) so you can weigh in on the discussion as well! You can tweet us anytime you like by hitting us up at @TeebzHBIC on Twitter. You can also post some stuff to Facebook if you use the "Like" feature, and I always have crazy stuff posted there that doesn't make it to the blog or show. There are lots of ways for you to interact on The Hockey Show, and we want to hear from you! The image to the left? A thing of beauty. 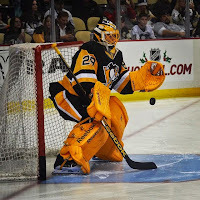 Marc-Andre Fleury donned his once-familiar yellow pads again as the Penguins took to the ice in their throwbacks, and he looks outstanding. Of course, looking the part means nothing unless he can play the part, so Fleury needed a big game against the Leafs tonight. Sidney Crosby was two points away from 800 in his career, the Leafs wore a special Pat Quinn patch, and Blake Comeau went off. In other words, Fleury's pads became a back story once this game started. Crosby added a pair of assists to become just the third player in Penguins history to hit 800 points, Blake Comeau's hat trick goal in overtime was the difference, and Marc-Andre Fleury picked up his 301st win in his yellow pads as the Penguins downed the Maple Leafs by a 4-3 score. For Comeau, it's the first hat trick he's recorded since March 2, 2010 when he was a member of the New York Islanders. "I'm getting a good opportunity to play with some really good players and it feels really good to contribute offensively," Comeau told reporters. "Things are going well right now at the start of the season." Comeau had just five goals with the Blue Jackets last season. He already has eight this season. Clearly, playing alongside Evgeni Malkin is paying off for Comeau. 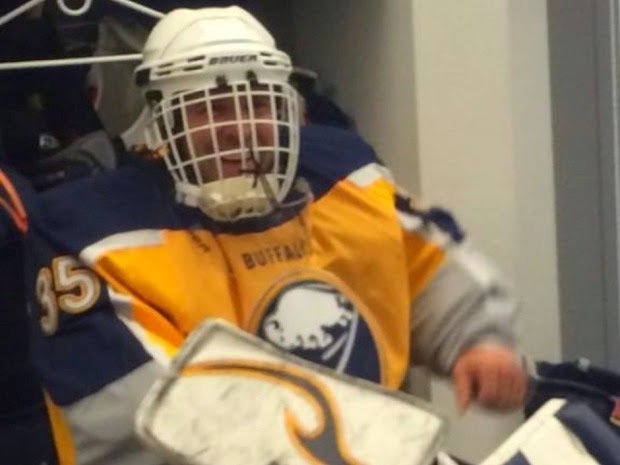 There was an unidentified masked man sitting on the Buffalo bench last Wednesday during the Sabres-Sharks game, but it was almost fitting. 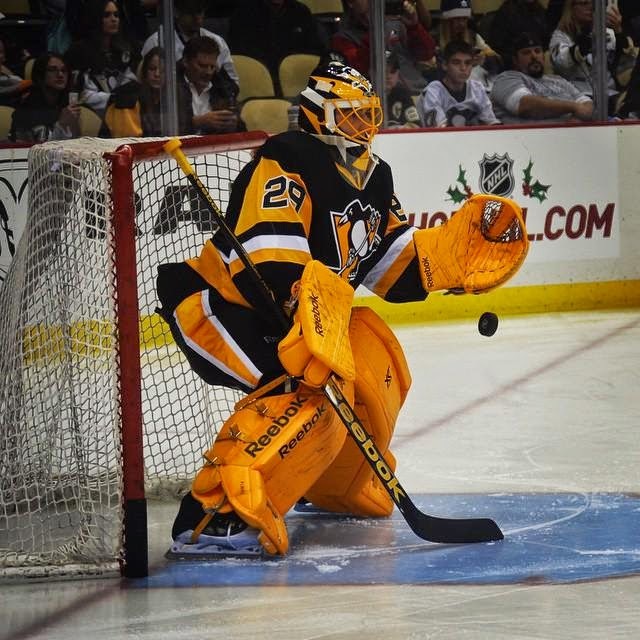 Michal Neuvirth was hurt during the first period of the game, forcing Jhonas Enroth into the game. However, that left the Sabres without a backup netminder with two periods to play. Who did they turn to in their time of need? Goaltending consultant Arturs Irbe! Irbe has played for a few teams in his career, but he broke into the league with the San Jose Sharks back in 1991 - the same team the Sabres were playing last Wednesday. 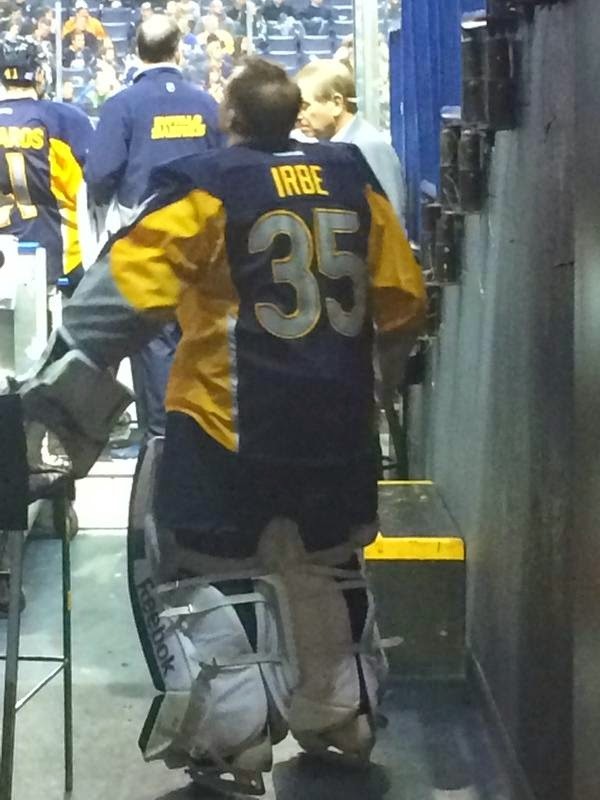 Irbe wasn't pressed into action, but the 47 year-old former NHL netminder didn't seem to mind suiting up for the Sabres for a couple of periods. It's been seven years since he played in a serious hockey game as a goalie, but he strapped the pads on and looked the part. "I said, 'Ted, I haven't donned a uniform in seven years,'" Irbe said, recalling the conversation he had with Sabres coach Ted Nolan during the first intermission. "And he said, 'It doesn't matter. Now you will.'" 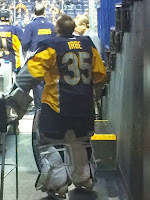 So does Irbe just keep a set of pads lying around the arena in case the Sabres need another goalie? The answer is no. Irbe used Enroth's backup set of pads, Ryan Miller's old blocker and catcher he left in Buffalo after being traded last season, and the equipment staff provided him with the helmet. "Once a goalie, always a goalie," Irbe said with a wide grin. Ain't that the truth! With the St. Louis Blues in need of another netminder after Brian Elliott was injured, the Blues began looking for some help for Jake Allen as he prepares to assume the starting role. Who did they turn to in their time of need? NHL all-time wins leader Martin Brodeur! Brodeur will practice with the Blues as they evaluate the netminder's play, but you have to know that Brodeur will take this opportunity very seriously in order to continue his career. While it's doubtful that the Blues will sign Brodeur to a one-way deal this season, it's a chance for the future Hall-of-Fame goalie to practice and get some work in with an NHL team. Brodeur will join the Blues on Friday for the morning skate before the game against the Edmonton Oilers that night, but it's expected that he won't be suiting up with Allen getting the start and Jordan Binnington backing him up. While I may have called for him to retire earlier this year, apparently there still might be work for the 42 year-old Brodeur yet. And he'll certainly try to make the most of it. Bryan Little was one second short of tying a record tonight. The man to the left? He holds the record. I won't tell you who he is just yet, but Bryan Little missed out on tying the fastest goal in franchise history tonight against the Columbus Blue Jackets. Little scored his goal just nine seconds into the game which is one second more than the record this player set on December 20, 2003 against the Pittsburgh Penguins. This player would actually go on to play for the Penguins later in his career, but he scored just eight seconds in on Sebastien Caron. Who is he? Who is this heroic individual? I shall reveal all after the video! Here is Bryan Little's goal against the Blue Jackets tonight. Most people hadn't even got to their seats before the Jets were up 1-0 in this game. Brian Engblom's idiotic commentary aside, that was a great individual effort by Little as he wound up in the neutral zone, used some great speed to enter the zone and split the defence, and Andrew Ladd fed him perfectly. It was the start of something great as the Jets prevailed 4-2 tonight over the Blue Jackets in which Evander Kane scored a pair of goals. As an aside, when was the last time I wrote "Kane scored a pair of goals" when referring to Evander and not Patrick? No clue. It's been a while. So who holds the record as described above? Set up by Vyacheslav Kozlov and Marc Savard, Robert Petrovicky scored on Sebastien Caron eight seconds into the game against Pittsburgh! 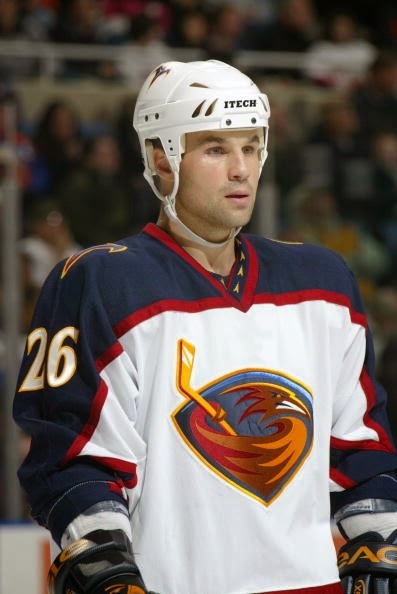 He would add an assist late in the second period on an Ilya Kovalchuk goal, and the Thrashers would go on to win by a 7-4 score. It just goes to show that scoring early often leads to wins! There is no denying the impact that both Viktor Tikhonov and Pat Quinn left on the sport of hockey. Both men were incredible players, leaders behind the bench, and both men built teams that were perennial championship favorites. Tikhonov was, of course, the architect and bench boss of some of the greatest teams in international hockey when he ran the Soviet Union's program. Pat Quinn oversaw the building of the Vancouver Canucks, and then ran the bench in Toronto where the Maple Leafs were continually a solid team throughout the latter half of the 1990s into the new millennium. I'm not going to run down both men's lives here, but I do want to point out the highlights in their illustrious careers. Mr. Tikohonov received the Order of the Red Banner of Labour in 1978, awarded to honour "great deeds and services to the Soviet state and society in the fields of production, science, culture, literature, the arts, education, health, social and other spheres of labour activities". He received the Order of Friendship of Peoples in 1981 for "accomplishments in strengthening of inter-ethnic and international friendship and cooperation, for economical, political, scientific, military, and cultural development of the Soviet Union". 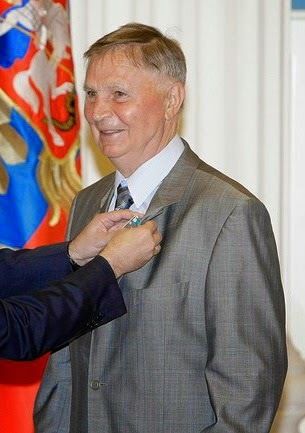 In 1983, Mr. Tikohonov was awarded the Order of Lenin - the highest decoration given out by the Soviet Union - for outstanding services rendered to the State, promoting friendship and cooperation between peoples and in strengthening peace, and for meritorious services to the Soviet state and society. Mr. Tikhonov was awarded the Order of the October Revolution - the second-highest honour given out by the Soviet Union - for services furthering communism or the state. And we haven't even started talking about the honours he received for his hockey contributions, although they played a big part in the above awards. In 1996, he was given the Order For Merit to the Fatherland for services to the State and outstanding contribution to the development of national hockey. In 1998, Mr. Tikhonov was inducted into the IIHF Hall of Fame as a builder for his work with the Soviet hockey program. In 1999, he was awarded the Medal "For Distinguished Labour" given to individuals to recognize and honour high performances in labour or contributions in the fields of science, culture or the manufacturing industry. In 2000, he was given the Order of Honour for outstanding contribution to the development of national hockey. In 2010, he was given the Order of Friendship for outstanding contribution to the development of national sport as seen to the upper right. He was also named as a Chevalier of Olympic Order and was awarded the Medal "For Military Valour", 1st class in his distinguished career. Mr. Tikhonov was also a defenceman with VVS Moscow and Dynamo Moscow from 1949 to 1963, winning four national Russian championships. He was the coach of the Soviet Union team that won eight World Championship gold medals and three Olympic gold medals in 1984, 1988, and 1992. Mr. Tikhonov also led CSKA Moscow to twelve consecutive Russian SuperLeague championships during his time behind the bench. Needless to say, he's a well-decorated hockey icon. 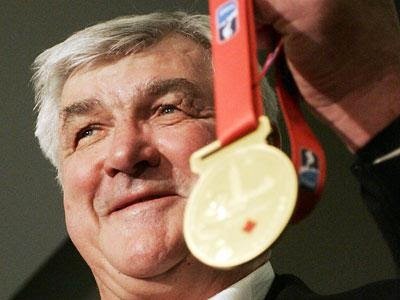 Pat Quinn, nicknamed "The Big Irishman", also had a host of accolades to his name. Mr. Quinn was named the Jack Adams Trophy winner in 1980 and 1992 with Philadelphia and Vancouver, respectively. During that 1980 season with the Flyers, Mr. Quinn coached the team to a record breaking 35-game unbeaten streak the ended with the Flyers losing to the Islanders in the Stanley Cup Final. He was part of the Team Canada coaching staff that captured the gold medal in the 2002 Salt Lake City Olympic Games, and followed that up as being part of the coaching staff that won the 2004 World Cup of Hockey. In 2008, Mr. Quinn led Hockey Canada's U18 men's team to a gold medal in Kazan, Russia, and followed that effort up in 2009 with a gold medal at the World Junior Championships in Ottawa. He was also a silver medalist at the Spengler Cup in 2006 when Canada lost to HC Davos in the final. Mr. Quinn also found success on the ice as he was a member of the 1963 Edmonton Oil Kings team that captured the Memorial Cup. He had originally signed with the Detroit Red Wings, but played his first NHL game as a member of the Toronto Maple Leafs in 1968. In 1970, the Canucks selected Mr. Quinn in the expansion draft, and, two years later, he was selected by the Atlanta Flames in the expansion draft. Mr. Quinn would nine play seasons in the league with the Maple Leafs, Canucks and Atlanta Flames. As a part-owner of the Vancouver Giants, he would win a second Memorial Cup in 2007. The Parkdale Arena in Mr. Quinn's hometown of Hamilton, Ontario had been renamed in 2005 as the Pat Quinn Parkdale Arena in his honour. We lost Viktor Tikhonov and Pat Quinn today after both battled long illnesses. Mr. Tikohonov passed away at the age of 84. Mr. Quinn passed away at the age of 71. The hockey world has lost two of best minds in the game of hockey today. Rest in peace, gentlemen. It was an honour to be able to witness your genius. I'll admit that there are some things in the hockey world that I have forgotten. I usually remember a lot of little details, but I occasionally stumble across something from the past that grabs my attention in a big way. Such is the case today as I was digging through the interwebs. There have been many hockey competitions at the Olympic Games held throughout time, but I had totally forgotten that the 1992 Summer Olympic Games in Barcelona, Spain had held a hockey event! Unlike the Winter Olympic Games, though, this was one that was borne out of Spain's culture. I have written about "quad hockey" or "roller hockey" in the past. However, I neglected to mention anything in that article about the 1992 Summer Olympics and how roller hockey was a demonstration sport at the Barcelona Olympics. I would have been an adolescent at the time of the Barcelona Olympics, so I don't recall a lot about the Olympiad myself. However, Joe DeLessio wrote a great article on it for Sports on Earth, and I think his article deserves a little recognition. Rink hockey dates back to the nineteenth century, when an Englishman named Edward Crawford adapted ice hockey for play on a wooden skating rink, and the earliest version of the sport used a wooden puck or flat disc as well as flat sticks. According to an informational booklet prepared by the IOC in advance of the '92 Games, the sport grew in popularity quickly, especially in England, where there were more than 600 roller rinks. By 1905, England had its first association of roller hockey clubs. In 1924, the sport had its first international federation. Two years later came the first European championships, and a decade after that, the first world championships. In other words, roller hockey goes back as far as ice hockey does here in North America, and the 1927 European championships show that it is nearly as old as the National Hockey League crowning its champions. That's pretty impressive. Again, hockey history doesn't just exist on ice as we can see! According to Mr. DeLessio's article, "the best players were able to play professionally in countries like Spain and Italy. In the United States, though, it remained something of a fringe sport. Its heyday in the U.S. spanned from the late 1970s to the late '80s, with its popularity mostly limited to pockets of the country, such as Texas and the Pacific Northwest. Various estimates put the total number of players nationally in 1992 at somewhere between 500 and 1,000." So it appeared the United States began to develop the game in its borders at one point, but somehow the popularity and novelty of the sport wore off. No reason is given why. As I pointed out in my article, Spain was already a solid competitor at international events, so including it as a demonstration sport the Olympics was a bit of a no-brainer. As Mr. DeLessio pointed out, then-IOC President Juan Antonio Samaranch had played the game himself. He also writes, "countries qualified for the '92 Games based on their finish at the in the 1991 World Cup in Portugal, organized by the Fédération Internationale de Roller Sports, a governing body that oversees not just rink hockey but all roller sports. The United States, while hardly a dominant power, was among the countries that made the cut." So that's how countries qualified for the competition. The countries that were invited to participate in just a men's tournament included Spain, the United States, Italy, Portugal, the Netherlands, Germany, Angola, Switzerland, Argentina, Brazil, Australia, and Japan. Group A would feature Italy, Portugal, Argentina, Switzerland, Japan, and the USA. Group B featured Spain, Brazil, Australia, Angola, the Netherlands, and Germany. Here are some of the highlights from the preliminary round. Japan, who finished last in Group A, got bombed in the preliminary round by Portugal (38-0), Italy (25-1), and Argentina (13-0). They gave up 95 goals in their five games, and scored just four - half of which came against Switzerland in a 9-2 loss. Italy and Argentina finished in a 3-3 tie on the first day of the competition before Italy went on a tear. They defeated Switzerland 8-0, the USA 13-2, Portugal 5-2, and Japan 25-1 to close out the preliminary round in first-place of Group A with a 4-0-1 record. Portugal finished in second-place with a 4-1-0 record while being the most offensively-prolific team in the tournament with 59 goals-for. Argentina finished third in the group with a 2-1-2 record, and these three teams would advance to the semi-final round. The United States finished the preliminary round in fourth-place with a 2-2-1 record, Switzerland finished fifth in the group with a 1-4-0 record, and Japan would finished 0-5-0. Group B didn't quite see any teams fall to Japan's level of play, but Australia finished in the same place in Group B as Japan did in Group A. They were destroyed 17-1 on the first day of the competition by Spain, 12-1 by the Netherlands on the fourth day, and scored four of their seven total goals on the fifth day in a 7-4 loss to Brazil. To Australia's credit, though, they only surrendered 42 goals in the competition. Spain cruised through the prelims with a 5-0 record to finish atop the Group B standings. Brazil's only loss came to Spain as they finished second with a 4-1 record. In a battle for the third qualifying spot, Germany and the Netherlands met on the fifth day with both teams vying for that spot. The Netherlands used a 3-1 first-half lead to pace them to a 5-3 win, giving them a 2-2-1 record, better than Germany's 2-3 record. As a result, the Netherlands finished third and Germany finished fourth. Angola finished in fifth-place as they brought home a 1-3-1 record while Australia went home with an 0-5-0 record. In the semi-final round, the top-two teams would battle for the gold medal while the third- and fourth-place teams would battle for the bronze medal, so every game counted. The Netherlands, unfortunately, would not record a win in finishing in sixth-place in the semi-final round, being outscored 29-5 in their five games. Brazil would also head home as they finished in fifth-place with a 1-3-1 record. Their win came against the Netherlands, but the draw they recorded came against Spain in which they played their best game of the tournament, posting a 2-1 halftime lead to tie the powerful Spaniards 3-3. It wouldn't matter in the end, though, as they fell to Portugal a day later, making it impossible to catch Italy for fourth-place in the round. The bronze medal game featured fourth-place Italy (2-3-0) and third-place Portugal (3-2-0). They had met on the first day of the semi-final round where Portugal outscored Italy 3-2 in the first half and 2-1 in the second half for a 5-3 victory. Portugal jumped out to a 2-1 lead in the first half of the bronze-medal game on goals by Luís Ferreira and Victor Hugo Silva while Francesco Amato had Italy's goal. In the second half, though, Italy played a dominant defensive game, holding Portugal off the board while getting goals from Massimo Mariotti and Roberto Crudeli to pace the squad to a 3-2 victory and the 1992 bronze medal for men's roller hockey! That leaves just two teams for the gold-medal match, and they come from both Europe and South America where the game of roller hockey is extremely popular. The home country of Spain finished atop the semi-final group with a 4-0-1 record while Argentina finished with a 4-1-0 record - their only loss coming to Spain by a 3-2 score. Would the host team get the same result in the gold-medal game? While the semi-final contest was closely contested with neither team giving an inch and capitalizing on the few mistakes the other made, the gold-medal match was and offensive explosion! The two teams battled to a 5-5 halftime score meaning that the first-ever gold medal in roller hockey would be decided in the second half. A 3-1 score in the second half for the Argentinians would be all that was needed for the country to claim gold as they downed Spain by an 8-6 final score. Argentina would win the first-ever roller hockey gold medal! This was the only Olympiad to feature roller hockey. The IOC had decided in 1989 that demonstration sports would no longer be included in the Olympics beyond 1992, so it would have to be included as a full Olympic sport beyond Barcelona. However, it was killed off at the 1996 Atlanta Olympic Games after some political in-fighting. Mr. DeLessio writes, "[S]ome in the United States Amateur Confederation of Roller Skating (now known as USA Roller Sports) pushed hard for the Atlanta Games to include not just rink hockey but also other roller skating disciplines, like artistic skating. At the time, he said, the U.S. federation was run by artistic-skating people, and they saw rink hockey as a sort of stepping stone to getting the other disciplines into the Games as well. The idea was that if they all didn't get in, none would." If roller hockey was a fringe sport in the US, artistic skating was practiced even less outside US borders. The IOC would have liked roller hockey to remain, but it was hesitant to include any other roller skate sports. As a result, roller hockey would only award medals at the 1992 Barcelona Olympic Games. There's a great historical look at one of the forgotten hockey events at the Olympics. Again, I have to credit Mr. DeLessio for prompting this article as I happened across his excellent and informative piece while searching for some information on inline hockey. I recommend reading through his piece as it's an excellent article on roller hockey in the United States! I fully admit that I am no Foster Hewitt. He was the pioneer of play-by-play hockey, and he certainly has more than his fair share of legendary calls when it comes to the game we all love. 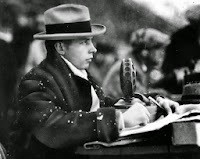 Foster Hewitt was the voice of Hockey Night in Canada for millions across this country when radio and the early television transmissions were filling the airwaves for hockey fans. Like Mr. Hewitt, however, I'll share one thing with him tonight. He worked alone, and I'll be the only guy doing the broadcast of the Manitoba Bisons women's hockey game as they battle the fourth-ranked University of British Columbia Thunderbirds! The game last night saw the Bisons pull out an impressive 2-1 overtime win in which Alanna Sharman scored the overtime winner, and goaltender Rachel Dyck was more than impressive. The Bisons seem to rise to the occasion each time they run into a ranked opponent, and there's a chance for the two-game sweep tonight as the two teams meet once more at Wayne Fleming Arena! The game will be broadcast via the internet feed outside the UMFM broadcast range, so if you want to tune in to hear my first broadcast this season you can find the link here to get the broadcast! The game starts at 6pm CT, so hunker down by the computer for some quality Canada West women's hockey action! Alanna Sharman sits third in Canada West scoring with ten goals and four assists, and her ten goals tie her for second-place in goal-scoring. UBC's Sarah Casorso and Rebecca Unrau leads their team with twelve points, and Casorso is tied with Tatiana Rafter for the lead in goals with six. Rachel Dyck continued her impressive play in her second season in Canada West hockey. She leads Canada West with her miniscule 1.32 GAA, her .942 save percentage, has one shutout, and owns a 7-2 record. UBC's Samantha Langford is third in goalie stats in Canada West as she sports a 1.67 GAA, a .938 save percentage, and has three shutouts in posting an 8-2-2 record. Needless to say, scoring goals on these two isn't an easy task. Join me tonight as I call the plays from Wayne Fleming Arena as the visting UBC Thunderbirds battle the University of Manitoba Bisons! We'll see you at 6pm! I'm not sure what the deal is in Toronto, but the media and some fans should seek some therapy. I'm surprised that people aren't standing outside the Air Canada Centre with torches and pitchforks demanding Randy Carlyle's head, but I suppose the win over Tampa Bay to end a three-game slide has saved Carlyle's skin for another week. However, the vitriol and anger the mob seems to have in Toronto has now turned its attention towards the players as they committed an act of pure treason after the win over Tampa Bay. No, they didn't kill a fan or sacrifice Carlton the bear. They did the worst thing imaginable: they didn't salute the fans! Seriously, Toronto, what the heck is wrong with you? Are you that self-centered? Are you that narcissistic? You put a 9-8 team in front of the firing squad, they dodged the bullets, and you still make mountains out of molehills. The salute to the fans happens 41 nights a year. Does it really matter if a team decides to skip it for one night? Look, I get the importance of having the players recognize the fans. Without the fans, there would be no million-dollar contracts. There would be no superstars with buckets of money made from merchandise sales. There would be no Rogers Sportsnet or TSN or CBC to fight over television rights. For the last few hundred hockey games played at the ACC, the Leafs have stood at center ice with sticks raised high in honour of those who have filled the uber-expensive seats at the ACC. It's a way of saying thank you to all those who filled the seats for their support. Again, it's an important gesture for the team to make regardless of win, lose, or draw. The problem is that when fans start eating their own, there's a general sense that a thank you may not be in order. People lost their minds this week, so one can understand if the Leafs' players don't feel all that appreciated. In fact, if I were a member of the Leafs, I'd pull a Maximus and challenge the crowd as well. Because the media in Toronto threw the Leafs under an electron microscope, the smallest of indiscretions are magnified beyond proportion at this point. Phil Kessel will sneeze, and there will be an ebola warning in Toronto. It's that bad, and the only people that are to blame are the media and fans in Toronto. Let me be clear here, Toronto: it's a hockey team, not a religion. It's a business, not a cult with defined rules of membership. The Leafs are still going to hover around .500 all season, and there will be both winning and losing streaks. People will demands trades and firings, but nothing will change unless Brendan Shanahan and Dave Nonis want it to change. The short message? Get over it, Toronto. Next week, there will be another concern and another reason to burn down the ACC. Russell Crowe will make a bad movie. 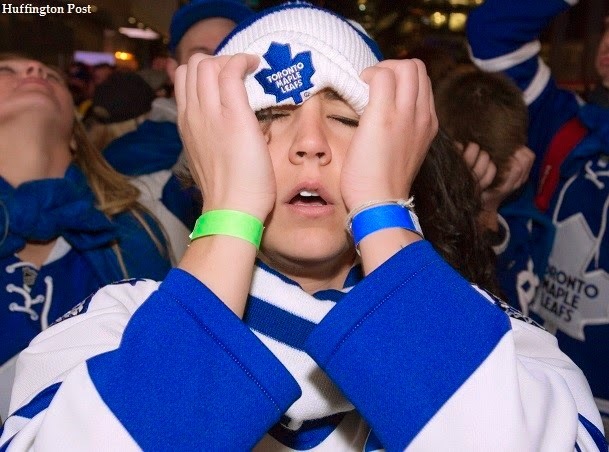 The Leafs will lose three-straight games. The world keeps on spinning on its axis. The sun rises in the east and sets in the west. In other words, Toronto, get over it. The Hockey Show, Canada's only campus-produced hockey radio show, is back tonight with our regularly-scheduled program as we dive into the hockey world from the last week and debate the facts, news, and opinions around the hockey world. There are some interesting stories to be discussed, and we'll bang away at those to give you some talking points with which you can agree or disagree. Also, we welcome Columbus back after a one-week hiatus in which she was reportedly working on a project, but most likely was off partying. We'll get to the bottom of that, too. Before we get started, Alan Doyle is in town! The problem? Alan Doyle isn't on our show! 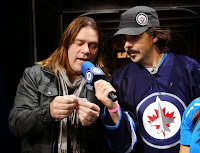 Alan, the lead singer for Great Big Sea, is a huge Montreal Canadiens fan and, as you can see, has been to at least one Jets game as he stands next to Dave Wheeler in the photo on the right. I've reached out to Alan via Twitter to see if he'd like to be on the best damned hockey show in Winnipeg, and the response has been silence. I have no idea if he's flying out today, but he was on the local production of CTV Morning Live this morning, so he's still in the city somewhere at this time. Your job? Tweet Alan at @alanthomasdoyle and tell him to drop by UMFM this evening, if his schedule allows, to chat hockey and have some laughs! BE POLITE IF YOU TWEET HIM! Ok? Ok. He left via airplane this morning. No dice on Alan Doyle at UMFM today. Thanks anyway, everyone. Tonight, Beans, Columbus, and I will discuss the recent woes of the Toronto Maple Leafs at the hands of the Buffalo Sabres and the Nashville Predators, the overreaction happening in Toronto, the Dion Phaneuf press conference, the comments made on Sportsnet by the analysts about what should be done, and where the Leafs go from here. We'll also chat about our favorite SPHL team in the Columbus Cottonmouths having two women referee the game tomorrow against Fayetteville, impending ads on jerseys, the possibility of William Foley and the Maloofs as owners of a potential Las Vegas franchise, the ECHL's Bakersfield Condors celebrating their Seinfeld night, Pascal Dupuis suffering another season-ending situation, and we'll talk about the Manitoba Bisons and their upcoming schedule. Lots to chat about tonight! Check out that banner! We're going back overseas tonight with a Russian Update - apparently "Roundup" doesn't translate into Russian very well - to check on the Manitoba-born boys playing in Barys Astana in the KHL, Brandon Reid in Vojens, Denmark, and Jared Aulin in Orebro, Sweden. We'll also take a look at Ryan Whitney's progress in the KHL with Sochi, and we'll talk about Guy Boucher being named as Canada's head coach for the Spengler Cup in Davos, Switzerland! This should be a solid Russian Update even though it's more European than Russian at this point. We'll be live on the air at 5:30pm and the phones will be open! Hit us up on 101.5 UMFM on your radio dial in the Winnipeg region or you can listen live between 5:30pm and 6:30pm CT on your web-enabled device at the UMFM webpage! Give us a call at 204-269-8636 (269-UMFM) so you can weigh in on the discussion as well! You can tweet us anytime you like by hitting us up at @TeebzHBIC on Twitter. You can also post some stuff to Facebook if you use the "Like" feature, and I always have crazy stuff posted there that doesn't make it to the blog or show. There are lots of ways for you to interact on The Hockey Show, so get involved! 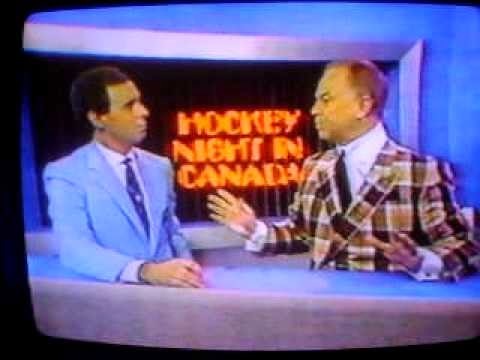 Don Cherry isn't actually getting 22 minutes of airtime. That would be longer than the intermission, so that's not going to happen nor are they giving him segments in each intermission either. As far as I can tell in my limited research, Don Cherry has never appeared on CBC's This Hour Has 22 Minutes as himself. Being as iconic as he is, the show frequently satirizes him and his commentary, but the icon himself has never appeared on the public broadcaster's sketch show. This week, though, 22 Minutes took things to a whole new level as they used Don's caricature to talk about some of the new developments in hockey. The result? Funny! Here is Mark Critch as hockey's most outspoken individual talking about ads on jerseys and the length of his Coach's Corner segment. And he knows who is to blame for this new trend. Not bad, right? I like the "NASCAR Ice Capades" comment. I have to admit that 22 Minutes really hits the nail on the head with this piece on Cherry. It's not disrespectful to Mr. Cherry in any way, and the comedy is linked to how he reacts to news such as the ads on jerseys. Honestly, I think this parody is pretty spot-on considering the outrage Mr. Cherry can show occasionally. Of course, Rogers could just have him pitching all sorts of stuff outside of ads on jerseys. This Hour Has 22 Minutes might be the best thing still going on Canada's public broadcaster now that Hockey Night in Canada is elsewhere. Well done, 22 Minutes! Collectively, a lot of Maple Leaf fans looked like the members of the Griffin family to the left after tonight's rear-kicking done by the Nashville Predators. Forget the fact that Buffalo had just bombed the Leafs for six goals in their previous outing. The Leafs were coming home and should have been angry, embarrassed, and wanting a better effort all-around to wash the taste of losing to the NHL's worst team out of their mouths. Instead, they vomited another garbage effort in tonight's game as Nashville pasted the leafs by a 9-2 score. It doesn't sound bad until you realize that Nashville led 8-0 with about twelve minutes to play. One word for tonight's game: UH-GLEE! If there is one thing that good management and coaches do after a couple of games like this, it's assessing the talent on the ice and the leadership in the room. Some of you will celebrate the fact that the Leafs are getting hammered right now, and that's ok. I know I'm not complaining. However, this team is clearly fragile in its current state, and it will take solid leadership to right this ship. That being said, no one's job should feel safe at this moment from the general manager right down through to the water boy. Although I can't see the water boy being a major factor in tonight's game unless he was filling the bottles with molasses. Let's run down how bad things were tonight. Taylor Beck - he of one career goal - scored on his first shot on the evening from the left face-off dot on what looked to be a very routine save for Bernier. 'Twas not, and the Predators had a 1-0 lead less than two minutes into the game. Derek Roy, who had not scored a goal in 38 games, outworked and out-hustled Dion Phaneuf to the front of the net to chip a centering pass from Matt Cullen into the yawning cage. Simply atrocious defence on this one from both Phaneuf and Cody Franson. Morgan Reilly, whose job it was to move Taylor Beck out from in front of the crease while penalty killing, somehow lets Beck set up shop in front of Bernier while Reilly stood in front of Beck. Forsberg's shot was blocked, but Beck had no issue putting the puck in from the doorstep. Seriously, Reilly, what the heck?!? Eric Nystrom, on a two-on-one with Olli Jokinen, opts to shoot from the high slot without even faking to Jokinen. 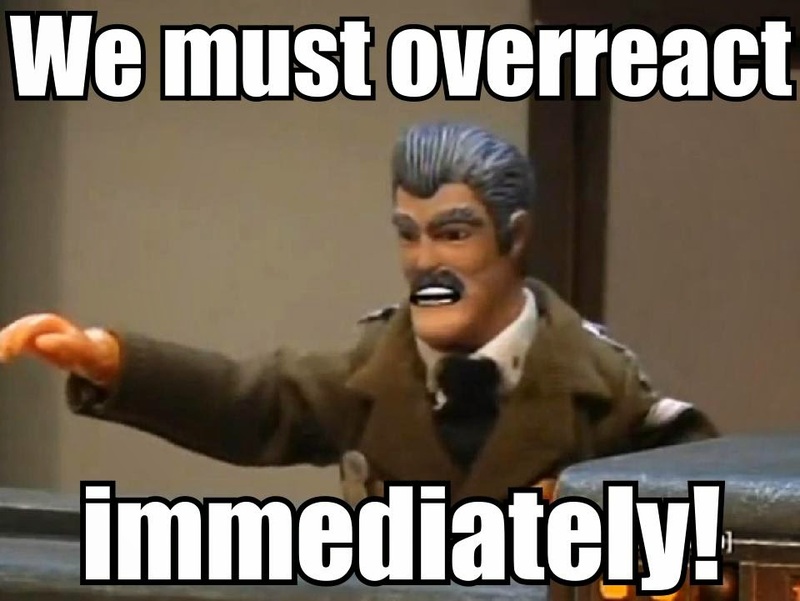 Reimer completely whiffs on the glove save, and it looks like Reimer-in-Buffalo all over again. Early in the third period, Mike Ribeiro is wide-open beside Reimer, and easily tips the Ryan Ellis point shot into the net. Ribeiro was behind the defence and standing beside Reimer. Incredible defensive awareness on this Leafs team. Peter Holland, a forward, was the closest guy to Ribeiro. Filip Forsberg scored a goal seconds later as he redirected the puck into the net with his foot. They reviewed it, and all was kosher. The problem? Forsberg had been pinned to the back boards by Roman Polak seconds earlier, only to release him and allow him to skate unobstructed to the front of the net. Seriously. Wow. Minutes later, Clay Wilson finds Calle Jarnkrok streaking towards the net for his first goal of the season. I have no idea why Stephane Robidas decided to lay out on the ice to try and block the pass from Wilson when he could have simply defended against him, but that was the first mistake. The second mistake was Morgan Reilly getting beat by Wilson and then casually skating back as Jarnkrok raced in. Pass, shot, goal, and a couple of minuses. That's about as far as I'm going to go because it should be pretty clear: all six defencemen were terrible tonight. The goaltending was terrible tonight. There were a couple of forwards that seemingly played well, but they were few and far between. I'm not saying that the Leafs need to proclaim DEFCON 1 at this point, but they might be looking at a DEFCON 3 at minimum. "It feels like every time we get down a goal or two we're trying to win the game in the next minute," defenceman Stephane Robidas told reporters. "We start taking chances, we turn the puck over. We're beating ourselves." This is a team that hammered the Boston Bruins a week ago with a convincing 6-1 win. They looked confident. They appeared to be putting together the little things to start climbing the Atlantic Division ladder. Instead, they rolled over against Buffalo and never woke up against Nashville in giving up fifteen goals including ten straight goals-against. This is beyond "we're beating ourselves". I understand that there will be scrutiny in Toronto of the highest magnitude when it comes to their hockey team, especially when it comes to Randy Carlyle's job security. However, there are a number of other players who should feel that they might be dangled as trade fodder after the efforts in the last two games. All Leafs' defencemen, especially the rarely-used Jake Gardiner, should feel that they are now competing to keep their jobs because there are some guys on the Marlies who seem to understand the nuances of the defensive game better than this group. The one finger I will point? Dion Phaneuf's leadership has never been questioned by the Leafs, and they have stood behind their captain since he was anointed the leader of this group. However, it's becoming increasingly clear that his leadership isn't getting the job done. I'm not sure if this is due to his messages, his style, or his command of the room, but it was clear that Phaneuf was just as shell-shocked as the rest of the squad tonight, and that's not how you want your leader to respond in trying times. His press conference after the game was even worse as he answered questions with the grace and smoothness as an elephant in ballet. "When you get beat like that in professional sport," he stated, "it's embarrassing, and to get beat like that in front of your home fans, it compounds the issue. So it's something that we obviously went through and it's unacceptable by our group to have a performance like that." The following question posed to Phaneuf went as follows: "Is this team consciously or non-consciously trying to get your coach fired?" First off, that's a terrible question. It's not like Dion is going to answer with a resounding "YES!" to that question. If they are "non-consciously" trying to get him fired, would they even know it? I mean, it's not like it's in their conscious state of mind, right? No offence to the reporter, but maybe come prepared with a real question next time because you're going to get a garbage answer to a garbage question like that. Dion, of course, answers with a curt "no", and the reporter presses on. "Then how do you explain Saturday night coming into tonight?" he asks. Ok, that's a better question considering some of the clichés that were heard after the 6-2 loss to Buffalo. "The game in Buffalo," Phaneuf stammers as he searches for an answer, "it's much of the same. We didn't play well, and you...."
Right there, he changes the focus of his answer. He goes back to clichés about not preparing enough, not doing enough, moving on after a bad game in Buffalo, blah blah blah. It's at that moment right there that I would strip him of the captaincy if I were Brendan Shanahan. He didn't answer the question with anything the reporters following this team don't know, and he certainly didn't accept ownership of the team's lack of focus or preparation as the leader of this team. He talked about it in a following question, but listening to him doesn't put the belief in you that anything will change. Maybe it's his demeanor or his lack of candidness following one of the worst losses on home ice in team history, but he doesn't seemed pissed off enough for me. Cody Franson was asked a similar question about trying to get Carlyle fired, and his response gives you more of a reason to believe that Franson is frustrated and cares more than Phaneuf. "[Expletive] no," he said. "That's crazy. That has nothing to do with it." The magnifying glass is directly over this team right now, and there's a ray of sun being focused on the group. Everyone inside that Maple Leafs' locker room is feeling the heat as jobs are on the line. The image to the left doesn't contain a video. Don't click on it and get frustrated because it isn't an actual video. It's just a picture representing what could be a video. However, that action leads me to something that I'm seeing more and more often, and, quite frankly, I find it to be bothersome. I understand that sports networks and various websites own the rights to video, but does anyone else find the practice of embedding video that auto-plays to be highly annoying? Look, I'm just one little blogger in the wilderness of the internet, so my pleas will go largely unheard and definitely will be unnoticed. I was taught long ago that embedding auto-playing video was poor etiquette in web design. I'm not sure when this etiquette changed, but I'm not a fan of it. TSN, Sportsnet, NHL.com - they all do it now. I know that there is increasing pressure to win a viewer's loyalty, but embedding video that auto-plays is the best way to get me to not visit your site. I'm already scrolling past the video placeholder at the top of the page because I simply don't care about the video. I want to read what the staff of that particular site wrote. If I wanted to watch highlights, I'd grab the TV remote. I'm already heading for the exit when I start scrolling past the video placeholder and the page freezes. I know what's coming next, and I'm not interested in having those around me know that I'm watching sports highlights. Hell, I don't even want to watch the highlight, yet the websites have to auto-play that video to get the commercial revenue! It's a load of garbage that I despise. Speaking of commercial revenue, remember when YouTube was a place for videos WITHOUT commercials? It actually existed like that. I know it costs money for websites to run their little enterprises, but auto-playing video that have commercials at the start is one of my most hated things about the internet. There's a special place in hell for people who auto-play commercials unrelated to the website I'm visiting. I always check the code before linking video here on HBIC to ensure that there is no auto-play feature. I would never force it upon you because I hate it, and I certainly enjoy you visiting. I'd hate my little corner of the internet if it auto-played video. HBIC has always maintained it is a blog "by the people, for the people, of the people", and I know this auto-play feature on some websites annoys you as well. Therefore, it won't happen on HBIC. Ever. I know this article seems like an oddity on a hockey blog, but NHL.com really annoyed me tonight with this auto-play video crap when I was looking for some information. 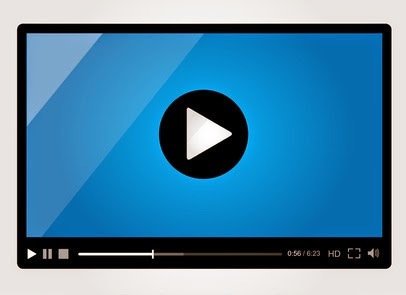 Put the option of watching the video back in your readers' hands. Generating income based on views of some commercial or whatever is terrible internet and your web designers know it. They just don't have the nerve to put their jobs on the line for it because that revenue is probably paying part of their salaries. You can be better, internet. Stop auto-playing video. The ECHL saw some fun in their ranks last night as the Cincinnati Cyclones and the Bakersfield Condors decided to dress up and put on a show for their fans. The Cincinnati Cyclones dressed up as R2-D2 for their Star Wars theme night while the Condors wore the puffy shirts as part of their Seinfeld theme night! These games are always great, and the auctions for these uniforms help a number of great charities, so I can't fault the ECHL for allowing these nights to happen. Let's take a look at the final products! Wow. Simply wow. 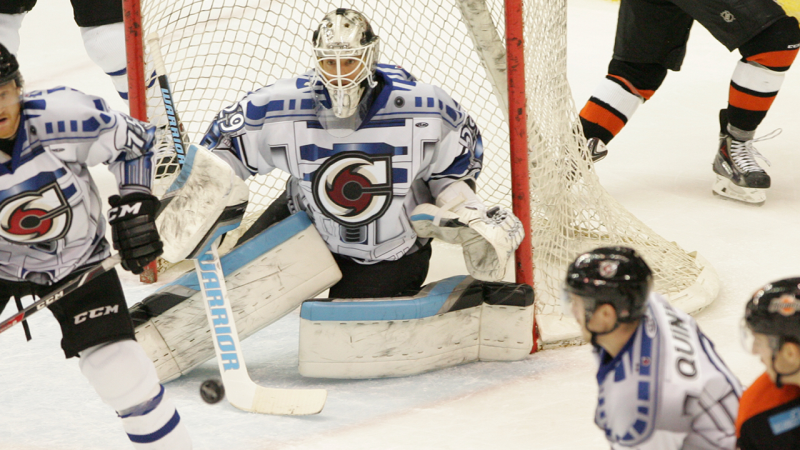 The Cyclones look pretty darn good in their R2-D2 uniforms! 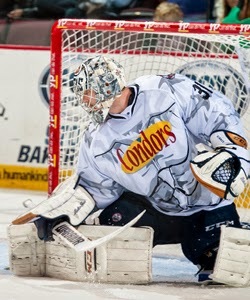 I didn't think that the pattern would translate well onto a jersey when on the ice, but the Cyclones proved me wrong! The 4-3-0-1 Cyclones had their work cut out for them as they battled the 9-2-0-0 Fort Wayne Komets, and things were an uphill battle from the start as the Komets jumped out to a 1-0 lead on a goal just 20 seconds into the game. However, rallies from 3-1 and 4-3 pushed this game into overtime as the Cyclones made it interesting and never said die. Overtime, though, solved nothing, so it was off to the skills competition for a final. It was former Cyclone Paul Crowder notching a goal in the fifth round of the shootout to give the Fort Wayne Komets the 5-4 victory over the Cincinnati Cyclones. 6844 fans went home a little disappointed in the outcome, but they couldn't possible be unhappy with the way the Cyclones played or looked on this night! The other themed gam that happened last night had the 8-5-0-1 Bakersfield Condors hosting the 9-3-1-0 Idaho Steelheads on their Seinfeld night! As you can see to the right, the puffy shirt jerseys were worn by the Condors, and their translation on the ice leaves one wanting a little more. Don't get me wrong when I say that this is a great idea, but game action makes it almost impossible to decipher that this is a puffy shirt as opposed to just some white jersey. Here's the video demonstrate what I was saying. It almost looks like a subdued camouflage jersey in some of those highlights. The Condors took the lead in the second period on a backhand goal by David Puddy (Sebastien Sylvestre), but the Steelheads would get that back a minute later to send the teams into the intermission tied at 1-1. The third period would solve nothing, so it was off to overtime! Just 1:36 into the extra frame, Idaho ended it with a goal. Like in Cincinnati, the fans went home a little disappointed, but their team looked pretty good as long as you had a seat closer to the glass! 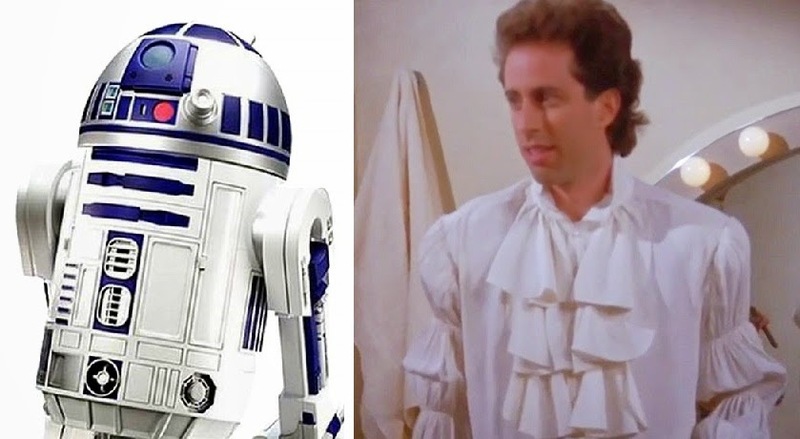 While I liked the idea of the puffy shirt, it just didn't translate as well in reality as it did in theory. The Star Wars jerseys seen over the years and the superhero jerseys seem to translate much better. Maybe there is something to having some color on uniforms to make them look a little larger than life? In any case, both theme-jerseyed teams lost in extra time tonight. Here's hoping the next theme jerseys can pick up a win! If you missed the announcement, news broke this week that the NHL had decided on potential new owners of a Las Vegas-based NHL franchise. The NHL has said nothing on the validity of the report, but the New York Post reported that the NHL had settled on billionaire businessman William Foley and the Maloof family, formerly of the Vegas-based Palms casino and former owners of the NBA's Sacramento Kings, as the new ownership group to plunk a team in Sin City. I'm going to comment on this news below, but regular correspondent and writer Neal L. has some thoughts on this announcement. 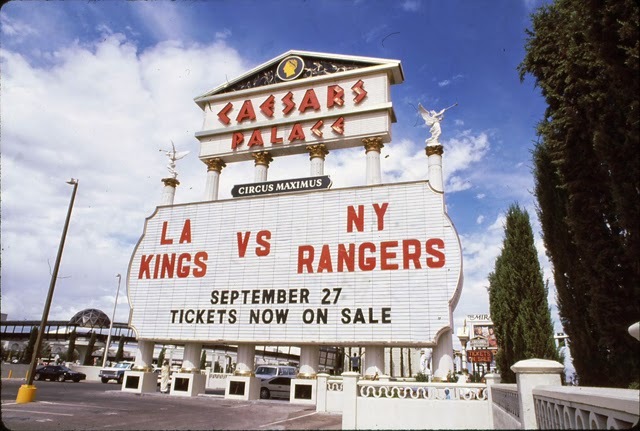 I've spoken about Las Vegas before as an NHL destination, but I always want kore perspectives. Neal provides one today, and I'll do a little commenting at the end. Here's Neal's thoughts on the new owners and potential NHL team in Las Vegas! There was a shocking leak in the New York Post that Las Vegas had been approved as an expansion franchise and an ownership group was in place. The rumor has that the franchise will begin play in 2017-18. This is something that normally I would be in favor of. In fact, I love the idea of having a franchise in Las Vegas, but I'm hedging my bets against this move. First, I'm going to go into details of why I support a franchise in sin city. I feel like this is long overdue for a professional franchise to be located here. The idea that gambling somehow makes this franchise a bad look is simply poppycock. Gambling is prevalent in all major sports - if anything it will likely be less existent given the fact the industry is regulated the most there. What isn't often mentioned besides the obvious examples in Europe where the two coexist is that currently the sports book in Delaware in nicely centrally located between pro franchises in Philadelphia, Baltimore, and Washington, DC. While the Delaware sports betting is only involving the NFL and must take place as a lottery with at least three teams selected, it shows that the structure is already in place. People aren't giving a second look when the Eagles allow a garbage-time touchdown that may change the spread, so I just don't see this becoming a long-time issue. The casinos wouldn't even allow bets on the Vegas games, so those games actually should be perceived as the most legitimate. While having a team in Vegas may fuel New Jersey's case for sports betting, that's none of the NHL's immediate concern. In addition, there are vast spaces in the west that are underserved by sports franchises. On the east coast, you may only have to drive fifty miles in either direction to find the next sports team. If you have to drive more than a couple hours to see your team, it is considered really far and a burden. For someone living in the west those few hours might represent their local team, or just to the point where another few hours gets them there. This isn't just an argument I use in favor of Vegas - this is also why I feel like places like Seattle, Portland, and Salt Lake City have for getting a team. There are hockey fans in many places out west and there is simply not a close venue for many of them to go to games and root for their team. In essence, the NHL has tons of money to which they have little access. For example, fans in Carson City, Nevada aren't putting up money to buy season tickets to watch the Sharks play. For them, it just isn't feasible due to the great distance. Vegas is a lot like Florida where there are a lot of transplanted people. You know people who may have come from a hockey-crazy city. If you put out a good competitive product, a fan base is already in place. If anything else, fans who have moved will want to buy tickets to when their teams play in Vegas or use the team as a reason to go on vacation in Vegas. Don't forget that Vegas is a nice place to go during hockey season when mostly everywhere in the NHL is cold, so it can be beneficial to everyone. Finally, it gives something the NHL should covet: exclusivity in a fairly large market. Until the other leagues start coming in, the NHL would be the only game in town. While maybe the population numbers for Vegas doesn’t compare to some other expansion options, let's not fool ourselves here: Vegas is big time. People who have a lot of money often reside or visit Vegas, and may be fans who can afford obscene prices for season tickets. 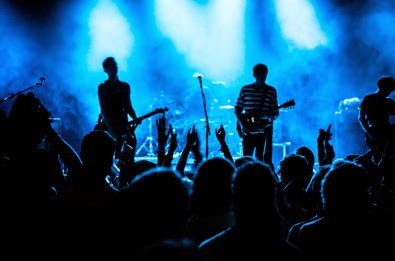 Las Vegas can truly can make their events an "entertainment extravaganza". Not only that, but it truly would be Vegas' team. There is no NFL team to steal customers for a Sunday night game and no baseball games to affect playoff crowds, making hockey literally the only game in town. Hockey traditionalists will say that teams shouldn't need gimmicks to get fans to show up to games. After all, Toronto wouldn't do it. I would say EXACTLY. While an Original Six city doesn't conduct itself like that, let Vegas be Vegas. I have always felt franchises should sort of be reflections of the city. Teams in New Orleans have always somewhat reflected a party attitude. I that vein, a Vegas team should reflect what Vegas is. If it truly can capture the Vegas spirit, it might even help it make it a popular destination for UFAs. I wouldn't expect a place like Boston to promote glitz and glamour like Vegas because it just wouldn’t fit in there. It does, however, fit in Vegas. Honestly, I could see Vegas becoming one of the top-grossing teams quicker than most people think. After all these reasons, why I am still lukewarm on this announcement? The reasoning is the ownership group involving the Maloof family. For those readers of HBIC that aren't familiar with basketball, the Maloof family owned the Sacramento Kings for a period in the late 1990s up until last year. Initially, Sacramento had a renaissance that saw them rise towards the top of the basketball world. However, the past decade has not been memorable to the Kings. They often tried to pass on the burden of building a new arena to the fans through tax hikes. They often tried to use relocation as extortion to get it done, using Anaheim, Seattle, and, conincidentally, Las Vegas as landing spots for the NBA franchise. The city, though, played hardball and won, essentially forcing the Maloofs to sell last year. Another huge blow is in the ESPN franchise satisfaction index in 2012. Under the Maloof’s ownership the team fell from #4 to #121 (out of 122) involving sports from all the major leagues. No one is going to argue that Sacramento threw a party when the Maloofs left town. Let's simply face reality: the league only has one shot to make this work. If this franchise fails, then it just becomes another one of Bettman’s failed expansion/relocation cities that aren't traditional hockey markets. It may hurt the chances of Houston or Kansas City who one day may desire NHL teams. What's worse for the city of Vegas is that an NHL failure very well might discourage other leagues from establishing franchises there. It will be known as a town that just couldn't cut it. That's why the ownership group has to be an exceptional one. Selecting a group that includes individuals who have a history of angering their customers is not good business. Sports owners really should have a one-strike-you're-out rule. There are so many millions, and now billions, of dollars at stakes in pro sports, individual leagues can't afford bad owners. It's one thing is a new owner arrives on the scene and just can't hack it, but it's completely different if one buys a team that already has a track history of being bad. The league, I believe, would be setting itself up for failure. This ownership group should simply be rejected by Bettman based on past results. It would be much better for the league to reject this group even if it kills expansion to Vegas. If it takes until 2020 to find a successful ownership group, wouldn't that be worth it? Vegas is a tourism mecca where customer service and customer experience rules. You truly need a fan friendly ownership group in Vegas more than perhaps any other city. So while the New York Post gave some potentially exciting news today, I'm still not sold. With this ownership group in place, it's like hitting on sixteen when the dealer has an ace. Sure, it could work out for you, but the odds are stacked against it. Hopefully, the NHL waits until a solid ownership group can step forward. Neal makes a number of good points in his writing, and he's certainly sold on Las Vegas as a hockey locale, but not on the reported ownership group as identified by the New York Post. Personally, I'm going to leave the stuff about Las Vegas as a hockey destination alone as I talked a lot about that in my linked article above, but I do want to focus on the ownership group as this is the crux of the report. William Foley, for his part, is not actually a billionaire. At least, not yet. Forbes estimated his net worth at $600 million dollars and identified him as a "billionaire up and comer". Foley is the chairman of Fidelity National Financial, and the company's bottom line appears to be growing steadily at this point. He was given $50 million in compensation by Fidelity in 2013 in his role as chairman, so it seems like his finances are, from the surface, stable and sound. As Neal identified, the Maloofs are the wild cards in this ownership group. They developed the Palms Hotel and Casino in 2000 into a destination in Las Vegas, so that's a plus on their record. However, a $600 million expansion was partly responsible for the sale of the 98% of their stake in the Palms to creditors in 2010. There's the tarnish to cancel out that achievement. As Neal pointed out above, the Sacramento Kings were a burgeoning NBA championship favorite during the 1990s as the Maloofs brought in players such as Chris Webber, Vlade Divac, and Mike Bibby to compete with the Lakers and Bulls. If it weren't for Shaquille O'Neal, Kobe Bryant, and the Lakers, the Kings may have been NBA champions at least once in their history. However, players began to retire or move on, and the Maloofs started having trouble attracting high-profile free agents like thy once did. In 2006 - nearly the same time the expansion at the Palms began - the Maloofs were pushing for a publicly-funded new arena in the Sacramento. As Neal stated, the push failed as the city decided against the idea of having taxpayers fund a Maloof-controlled arena. With no new arena and their known financial situation starting to crumble, the Maloofs began threats to move the Sacramento Kings to more modern facilities in Anaheim in 2011, going as far as filing trademarks on the name "Anaheim Royals". Former NBA player and mayor of Sacramento Kevin Johnson, however, intervened and asked the Maloofs to reconsider an arena idea in Sacramento that involved less public funding. The Maloofs backed off their relocation idea, and began work in looking at a new Sacramento facility again. The Maloofs and the city of Sacramento came to an agreement on a brand-new Sacramento arena in late 2011, but the Maloofs got cold feet in April 2012 and backed out of the $391 million arena. The popularity of the Maloofs in Sacramento plummeted with the news and a struggling team. It took a further hit when the Maloofs organized a deal with a Seattle-based group to move the Kings to Seattle with the construction of a new arena there contingent on the sale, but the NBA Board of Governors blocked that move. Fans revolted against the Maloofs, and the cracks in the Maloofs' NBA bottom line began to show. In May 2013, the team was sold for $535 million and remains in Sacramento despite the Maloofs' best efforts to destroy any fan support the team once had. The Maloof family had a half a billion dollars in their bank account, and they got out of Dodge as fast as they could. And now, they come looking for an NHL team that can be put where they amassed their wealth. I think there should be some trepidation that goes along with any conversation about the Maloofs. We've been able to watch and document the struggles that Phoenix - a much larger city than Las Vegas - went through with the Coyotes, so the problems of Phoenix could very well be present in Las Vegas compounded with a smaller market. The Maloofs ran the Sacramento Kings into the ground in a small NBA market in Sacramento, so this should be a bright red warning flag on their file. The second issue I see is that the net worth of the two parties - Foley and the Maloofs - right now has just over a billion dollars in their portfolio, but the Maloofs have no way of sustaining their net worth unlike Foley. While they are involved in some entertainment ideas, they don't have a defined income source that will continue to build their net worth to offset potential losses by an expansion team. And let's be honest here: expansion teams lose money for a number of years before gaining a hold in a southern locale. Ask Florida, Tampa Bay, Atlanta, and Nashville about their early years. The idea of having a solid backer and a less-rich front man has worked in other small markets. Winnipeg, for example, has an uber-rich partner in David Thomson while Mark Chipman is the rich front man who is the face of the franchise when it comes to ownership. It works for Winnipeg and the team is on steady financial ground, so there's an example where an uber-rich, self-sustaining partner funds the team and arena while the less rich partner funds parts of the franchise in his own right. However, the differences are vast between the Winnipeg ownership group and the Las Vegas ownership group. Foley is nowhere near as rich as David Thomson, and the Maloofs' track record is a stark contrast to how Mark Chipman ran his franchises. Like Neal, my fear goes back to the Maloofs in this equation as they have exhibited none of the traits you'd expect from a potential owner. That alone should be the sole reason this Las Vegas ownership group is put on the back burner. These reports on Vegas are certainly interesting as a hockey fan, but the reality is that this potential expansion team has to start laying the groundwork now for it to have a strong local season ticket base so it doesn't have to rely on tourists to fill the arena. Yahoo's Puck Daddy blog spoke with Bill Johnson, COO and president of the ECHL's currently-suspended Las Vegas Wranglers, who stated, "Bottom line: Any professional team that is relying on the strength of the visiting team schedule and/or tourists to make up for any lack of critical mass of hockey-oriented locals is probably leaving a lot to fall outside their control. It's naïve and a rationalization. And it will be doomed." As an aside, I highly recommend reading all of Billy Johnson's comments on the Puck Daddy blog. Excellent work by Greg Wyshynski on that piece, and it speaks to the heart of the problems an NHL franchise will face in Sin City. Right now, that should be the top priority for any ownership group because Las Vegas still markets itself as a tourist destination. Without the support of the local fan base, talking about Las Vegas as an NHL city is nothing more than an academic exercise with or without the questionable ownership of the Maloofs. The woman on the left is former ESPN reporter Rachel Nichols. Miss Nichols no longer works for the network that hates hockey, but hosts an informative news talk show on CNN called Unguarded. Personally, I'm quite impressed with Miss Nichols' work on Unguarded, and I happen to find CNN's treatment of the NHL to be quite reasonable considering that they are based in Atlanta, Georgia. Tonight, Miss Nichols had the privilege of having NHL Commissioner Gary Bettman on her show, and the interview was interesting albeit brief. If CNN continues to have interviews like this with members of the NHL's brain trust, I'll be tuning in far more often to watch what the NHL reveals in these types of interviews. Here is the four-minute clip from tonight's episode of Unguarded with Gary Bettman. I'll comment below, but I have to say that the rapport between Miss Nichols and Mr. Bettman seems to be pretty good! The unintended joke about Mr. Bettman's age gives you a perspective on how long Mr. Bettman may stick around for based on his tenure. He's 62 and he's been on the job for a while. It might be a long way off still, but maybe Gary is looking to wind down his role with the NHL if and/or when the NHL expands to 32 teams. It may not happen, but it's something to keep in the back of one's mind, though. His comments on gambling in professional sports are interesting, but very middle-of-the-road. He's very astute when it comes to watching the spread as fantasy owners and bettors watch these numbers very closely, but I'm not sure that most fans are gamblers. That being said, I think he's right to be careful, especially when it comes to a new franchise possibly landing in Las Vegas. I'll have a guest contributor piece on that tomorrow. Mr. Bettman's comments on domestic violence are interesting with respect to Slava Voynov's situation. The fact that the NHL claims to have been doing counseling on this front for more than a decade was news to me. I'm not saying that there has been a domestic violence issue in the NHL for more than a decade, but there have been cases in the past that haunted a few players. Perhaps the NHL recognized this as a potential problem and nipped it in the bud before things got worse? The chatter about the Olympics is the same old rhetoric. Let's be honest: the fans love the Olympic men's hockey competition with the NHL players participating. I know that Mr. Bettman says that they aren't focused on the Olympics right now, but they have to know that the fans want it. As for the World Cup of Hockey, I'm glad they're looking at this, but we've seen some players burn out after the Olympics. Holding a World Cup before the season starts might also contribute to some burn out as the season progresses. It's still an interesting idea, though. Personally, this was a good show from the Commissioner as he spoke about some topics that the NHL is currently facing, and came away as being competent and fair in his comments. Miss Nichols' questions weren't of the Ron MacLean style where he hits the Commissioner with some tough questions, but the questions she asked were relevant to recent and future events and were of the investigative journalism nature for which Unguarded is being known. Overall, this was a good, albeit brief, showing for the Commissioner on US TV, and I'm happy he came off as being in touch with his league, the players, the owners, and the fans. Hockey has never been stronger, as Mr. Bettman said, and he's showing that to a country that is still buying into his product. The Hockey Show, Canada's only campus-produced hockey radio show, is excited to have not one, but TWO, guests on the show tonight! We've been lucky enough to have a few musicians on to talk about their hockey experiences such as Vince Fontaine and Jay Bodnar, and we're going to feature two more musicians who want to talk some puck! I had the pleasure of listening to the newest single from their upcoming album, and I have to say that these guys should be on your playlist going forward! Tonight, The Hockey Show is proud, honoured, and privileged to speaking with Ciarán Downes, Jake Heise and Cole Mortillaro of the Burlington, Ontario-based band known as Big Lonely! These guys are "a picnic basket of smoldering emotion, waiting to erupt" - their words, not mine - as they make their way onto the Canadian and worldwide music scene! Honestly, they have a great sound, and we'll lead into the show with their new single, Dirty Clocks, which you can find embedded below as a preview! 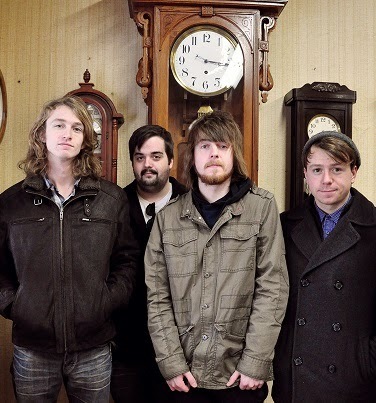 We'll talk to Ciarán (vocalist and guitarist), Jake (lead singer and guitarist) and Cole (drummer) about their music, their influences, their new video linked below which features hockey, their hockey interests, and a pile of other stuff. If you're trying to decipher which two of the four pictured above are Jake and Cole, Jake is on the very left of the photo, Ciarán is out front, and Cole is on the very right! There will be no 3 ROUNDS DEEP! or Russian Roundup tonight as we talk with the gents unless they want to play. The phones will also be closed as we chat with Jake and Cole via phone, so we're not going to put them on hold by any means. However, if you have a question for the guys that you want asked on-air, feel free to use the Twitter or Facebook link below! Here's the video for "Dirty Clocks", Big Lonely's newest single off the album Close Your Eyes, Keep Talking that is set to hit record store shelves on December 5th! It makes a great Christmas gift for your music-loving, hockey-mad Christmas wish-maker this year, so get down to your local record store in a few weeks and pick up Close Your Eyes, Keep Talking! We'll be live on the air at 5:30pm with Big Lonely's Ciarán Downes, Jake Heise and Cole Mortillaro! Hit us up on 101.5 UMFM on your radio dial in the Winnipeg region or you can listen live between 5:30pm and 6:30pm CT on your web-enabled device at the UMFM webpage! You can tweet us anytime you like by hitting us up at @TeebzHBIC on Twitter. You can also post some stuff to Facebook if you use the "Like" feature, and I always have crazy stuff posted there that doesn't make it to the blog or show. Junior hockey fans held their collective breath on Tuesday night as it was announced that Erie Otters phenom Connor McDavid had injured his hand in a fight. Erie had a comfortable lead on the Mississauga Steelheads last night when Mississauga's Bryson Cianfrone threw a check on McDavid behind the net as he passed the puck out to the half-boards. The puck came back around the boards behind the net where McDavid whacked Cianfrone with his stick up high on his left arm - a little retaliation for the hit. Cianfrone, though, then whacks McDavid, and both players come nose to nose and toes to toes. Several punches to Cianfrone's head later, and the linesman guided McDavid to the penalty box while clutching his right hand. There's your story as McDavid is "out indefinitely" with a hand injury. Imagine what it says about a society that allows unpaid teenage boys to fight with their bare knuckles for the amusement of paying customers. For all the good things there are about junior hockey in Canada, and there are many good things, this continues to be an appalling black mark on the sport at this level. Yes, there's a lot less of it than there used to be. A lot less. That there's any at all is sickening. Wait a second. Hold on here. There's a lot less fighting than there used to be, yet this is still "sheer barbarity" according to our fair scribe? How is this an appalling black mark if OHL Commissioner David Branch has imposed some of the toughest penalties for fighting in hockey anywhere on the planet? All Mr. Cox has done is taken an isolated incident of the best player in junior hockey and turned it into a crusade against the CHL for allowing fighting in hockey. Here's the thing: fighting actually isn't allowed in hockey! That's why players are penalized for doing it! That's why there are rules against it, and why most leagues are tightening the noose around fighters to ensure that hockey comes first. The fact that Mr. Cox has used Connor McDavid's injury to try and shame the OHL is shameful. Let's go back to the video and watch what happened. I'm pretty sure that McDavid is no saint in this clip. All McDavid has to do is skate away. Let Cianfrone have his little whack at the end, don't put your glove in his face, and don't let yourself be goaded into a fight. Your first OHL fight. Your first fight in your career where another teenager is trying to take your head off. McDavid was an active and willing participant in this scrap the moment his hands came up and towards Cianfrone's face. The slash he laid on Cianfrone after he took the hit started the dominos falling which resulted in McDavid's injury. Mr. Cox writes, "Not one little bit of this superb player's game is about toughness, or being tough, or fighting. He won't ever bring spectators to an NHL rink with the promise he might fight. He will pack 'em in with his scoring talents and ingenuity." All of that is true. The problem is that he started the skirmish with Cianfrone when he slashed him. Cianfrone took exception, McDavid threw his hand in Cianfrone's face, and off came the gloves. So when Mr. Cox writes about how McDavid's game doesn't contain "toughness, or being tough, or fighting", he's right that his game doesn't contain those elements, but he's still a 17 year-old kid. They're just a tad unpredictable in their behavior most times. 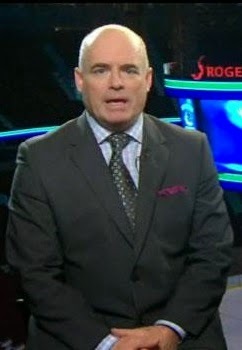 Mr. Cox writes, "Was it McDavid's choice to fight? Ultimately, yes. But we know the pressure that is put on hockey players to 'man up' and drop the gloves, and we know of the sport's general indifference to the abuse heaped upon the better players by the less talented." This is such an ignorant, sweeping generalization that it astounds me that Mr. Cox has a job in sports. I'm quite certain no one in the Erie Otters organization has ever told McDavid that he should fight more, to "man up", or to show some toughness. The fact that the kid takes a ton of abuse from opponents on a nightly basis as the best junior player in Canadian major hockey is evidence enough of how tough he is. He needs to prove nothing when it comes to toughness, and everyone - including any scouts watching - would tell you that, Mr. Cox. 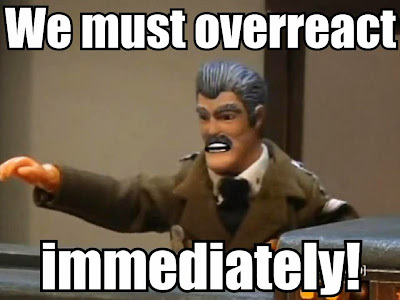 Secondly, McDavid actually started this fight. Watch the video above. He's no angel. He took a hit, slashed Cianfrone up high on the arm, Cianfrone responded to the slash, and then McDavid had his gloves in Cianfrone's face. Even if both players drop the gloves, McDavid has to know that his hands are worth more than just chucking knuckles at the top of a guy's head. Wrestle Cianfrone to the ground, and walk away! There's no need for McDavid to take this fight, but he instigated it. The fact that he stood in there is a good enough show of toughness considering this fight wouldn't have happened had he not slashed Cianfrone. Mr. Cox writes, "We also know that there are knuckle-dragging scouts out there who would excitedly put a star beside McDavid's fight as though it represents his guts and desire. These are the same folks who see PIMs are a big plus with any player." This isn't the 1970s with the Broad Street Bullies, Mr. Cox. The fact that you wrote this shows how disassociated you are with the game today. All of the CHL teams that are exceptionally good base their game plans on skill and speed. In fact, Erie has the lowest team PIMs in the OHL's Western Conference at 210, and the second-lowest in all of the OHL. They are 16-1-1. Scouts aren't going to watch anyone on the Otters for their pugnacious skills. Mr. Cox writes, "So if he's been injured badly in a fight, let's make sure the game, and the junior game, doesn't get away without taking significant responsibility. If you permit players to fight and remain in the game, to some degree you are promoting fighting, allowing it to be used as a tactic and encouraging players to fight. It's that simple." So when Vincent Lecavalier and Jerome Iginla fought in the 2004 Stanley Cup Final, they both should have been tossed? When Sidney Crosby crotch-punched Boris Valabik a few years ago, Crosby should have been tossed? Look, none of those players have a long rap sheet of fights that can be pointed at and used as an example of "promoting fighting". One was a highly-intense game where emotions bubbled over, and the other was a player tired of the abuse and decided to do something about it. To try and spin fighting and allowing a fighter to serve his penalty as a way to promote fighting is one of the dumbest things I've ever read by Mr. Cox, and it really has me questioning how he arrives at his conclusions. On top of that, the penalties for fighting a second time within the same OHL game have now reduced the chances of a repeat offender. As per the OHL rulebook, "The number of fighting majors that a player can receive in a game before a game misconduct is assessed shall be reduced from three (3) to two (2)", meaning that if you decide to drop the gloves a second time in the same game, you get an early dismissal from the game. Again, I'm not sure if Mr. Cox simply doesn't understand the rules in the OHL or completely ignores them, but he's way off the mark here. Mr. Cox writes, "Surely an organization that can take drastic punitive action against teenagers who say inappropriate things on social media can take a similarly hard stand against bare-knuckle brawling." Yes, just like police can prevent fights outside bars by outlawing it. Or how police can prevent robberies by outlawing it. Or how there are no more murders because law enforcement takes a hard stand against murdering another human being. Just because it's not allowed doesn't mean it won't happen, and that's why there is a rulebook for hockey that contains the penalties that should be assessed if a player breaks the rules. Idealism is a fantastic fantasy, but Mr. Cox needs to check back into reality. The cold, hard facts in this case are simple: McDavid instigated the fight, McDavid didn't back down, McDavid threw a number of punches, and now McDavid has a sore hand. No one, to my knowledge, had ever questioned McDavid's testicular fortitude at any point yet, but Mr. Cox seems to believe that the OHL and the hockey establishment played a large part in questioning McDavid's toughness. Again, the massive dissociation that Mr. Cox has from the actual men on the ground - scouts, coaches, players, and fans - is clearly evident in his outrageous claims. As MacLean's magazine's Nick Taylor-Vaisey wrote on October 2, 2013, "[T]wo truths emerge: Fighting is a part of hockey. Everybody hates an injury." No one should be excited about Connor McDavid's injury, but it wasn't because junior hockey or the NHL had a hand in it in any way, shape, or form. To suggest that they do and all but absolve McDavid from any responsibility for his part in the fight is about as irresponsible as one can get.